This is an advertisement for Clarke's gas stoves. When gas burners were first introduced they could be dirty, smelly and quite dangerous. Burners like the ones advertised on this leaflet would have been very popular because they were clean, there was no smell, no smoke and according to the leaflet, ‘no danger’. 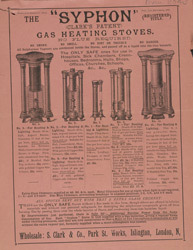 Gas burners really became popular in the 1880s when hire purchase schemes were introduced so that people could afford to own one.